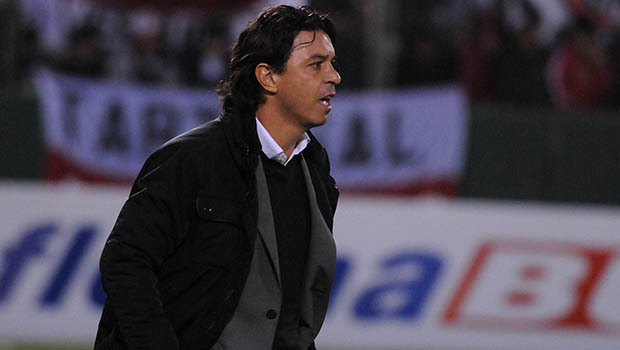 Four years have pass since the beginning of a glorious stage On July 27, 2014, Marcelo Gallardo officially debuted as River Plate’s coach, at a match against Ferro, for the Copa Argentina. Four years ago, Marcelo Gallardo was sitting for the first time in an official way, in the bank of “El Más Grande” (although the premiere had been in a friendly match against Millonarios). River faced Ferro for the “Copa Argentina”, in a match that ended in a draw without goals, but later River had a victory (6-5 by penalty shoot-outs). That was the beginning of a period full of titles and joys for the entire River Plate people. Through hard work, sacrifice, discipline, uniformity and temperament, “El Muñeco” forged a unique identity that took him to the top, to enter forever in the heart of the fans and earn a place in the River Plate hall of fame. In that same year, River won the “Copa Sudamericana”, with the incentive of leaving Boca Juniors along the way (semifinals). In those well-remembered crosses (0-0 away game and 1-0 home game), Marcelo Barovero’s flight was immortalized, at the penalty kicked by Gigliotti, and also the low left by Leonardo Pisculichi which led River to the final. There, “El Millonario” won with authority against Atlético Nacional de Medellín and “El Muñeco” made his first Olympic lap. But the joy was just beginning: at the start of 2015, River won the South American “Recopa” after beating 1-0 San Lorenzo, twice. And the ultimate dream of winning again the “Copa Libertadores” came true that year, turning that semester in to a really memorable one, once again knocking out Boca. At the final, they won against Tigres of México in a Monumental exploited with happiness. A few days later, the team traveled to Japan to play the “Suruga Bank Cup” and again, defeated 3-0 the opponent team, taking home a new cup. This is the way River became the first team to possess the four CONMEBOL competitions: Sudamericana, Libertadores, Recopa and Suruga. The year ended with a participation in the “Club World Cup” and a final against the best Barcelona ever seen. In 2016 and 2017 the winning strike continued: River won the “Copa Argentina” twice in a row and was also a two-time champion of the South American “Recopa”. And this year “El Millonario” defeated Boca again in the Argentine “Supercopa”. Now, four years, many laps and celebrations later, the love of the fans and of Marcelo Gallardo is so great, and reciprocal, that it’s hard not to imagine him sitting at the Monumental.